What's a fond summer memory of yours? For me, a memory I recently thought fondly was when I enjoyed childhood visits to a local drive in with friends. It would be a lazy summer day and my friends in the neighborhood would walk over to Shirl's Drive In for ice cream to beat the heat. Afterward, we'd go next door and play a round or two of mini golf. Ah, fun summer times! Shirl's is still there after all these years and still serving up great ice cream and other menu favorites. Shirl's was always known for having great ice cream. But if there was a sandwich I'd recommend, it would definitely be a Cheesy Grub! Seasoned ground beef is mixed with a creamy cheese sauce and served up in a steamed hot dog bun. It's messy but oh so good! When I visited my hometown not too long ago, I had a craving for a Cheesy Grub. I had one and was inspired to try making them at home. I mean, how hard could it be? Thankfully, after some tweaking, this recipe definitely is spot on and now I'm not too far from getting a taste of my childhood. Another bonus is that the filling for this sandwich can be used in other ways. Aside from a sandwich filling for a cheesy grub, you can stir in macaroni for a cheeseburger macaroni casserole. This is even delicious over fries or baked potatoes! In a skillet, brown ground beef and season with Montreal steak seasoning and Worchestershire. Drain off any rendered fat and set aside. In a saucepan, melt the butter and whisk in the flour. Allow to cook for 3-4 minutes over medium high heat until mixture is light brown. Slowly whisk in the milk and bring it to a boil. Continue whisking until smooth while it thickens. Remove it from heat and stir in the cheese until melted. Season with salt and pepper to taste. Pour the cheese sauce over the seasoned ground beef and stir to combine. 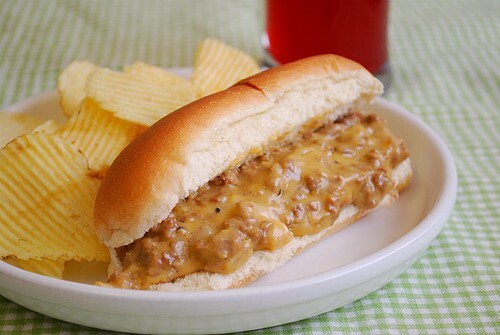 Use the cheesy beef as a filling for sandwiches, best served in hot dog buns just like the original Cheesy Grub! Oh yum....that looks so good. Love sloppy joes...this might look even better!! Now we're talking! This looks so good. I love sandwiches like this! mmmnnn...comfort food at its finest!! I grew up on Shirl's! Im trying your recipe to see how close it is. Worked and tasted perfect! Great job. What is Montreal steak seasoning? just went to the store to purchase all the ingredients i need for this!! So excited to make it tonight! I'll definitely be doing a post about it as well!! I've been visiting Shirl's since it opened on Washington St about 60 years ago. Here's an authentic Grub recipe: Season with Salt & Pepper and Brown 1# of ground chuck and 1/3# of ground pork, drain most of the fat - not all. Reduce heat and throw in 1 or two minced garlic cloves, stir for a minute, don't burn the garlic. Add 1 packet of Onion Soup Mix, stir. Then I run it through a food processor to make it fine (authentic, but not necessary). Now add 1/3 cup of beef consomme and 3/4 cup of tomato juice, simmer and reduce, you want it like sloppy joes not dry. Add more pepper and tomato juice if necessary - enjoy it on its own or with cheese sauce. Note: Montreal Steak Seasoning is on the spicy hot side - Grub Burgers are NoT.